Now that is a beautiful color combo. Of course I'm partial to orange. Missing you this series, the Astons are running strong right now...Look to come out at least one Wednesday this summer. Another "must-have". Don't you think it's amazing that there are two Canadian drivers in the top rungs of this very German/Euro series? The cars look fantastic. 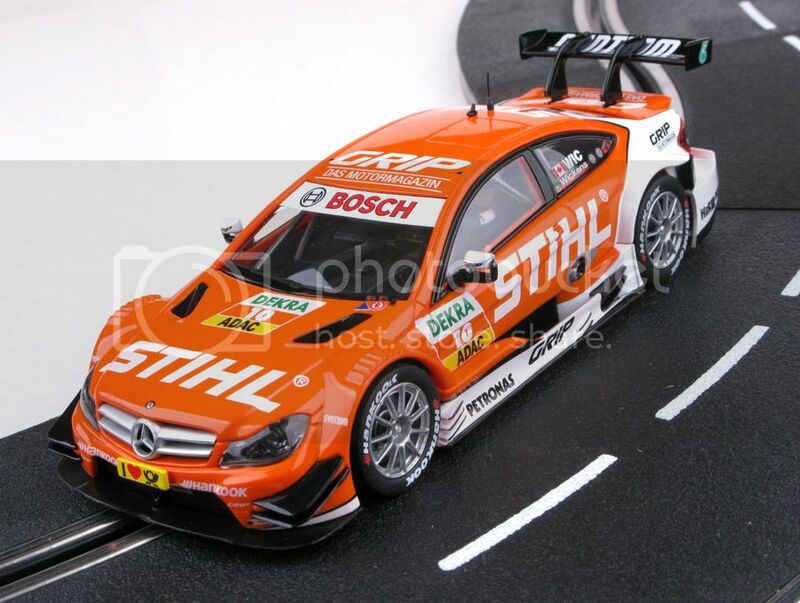 I've got to have the Wickens Mercedes to run against the Spengler ( ) BMW. Last edited by Old23; 07-02-2015, 07:43 PM. No mag, chipped for scaley, using RCS64 RMS. Thanks again for the nice Carrera banners and the other goodies in the swag bag!! A couple of weeks ago, along with our current series, 70's F-1 and Group C, we added a Carrera DTM race. Run IROC style --so the 4 cars each stayed in the lanes -- we had a great bash!! Cars were modified with smaller guide and rubber tires --but that's it. Their weight meant that you had to re-learn a lot of braking points --but it was great fun and they are wonderful cars. 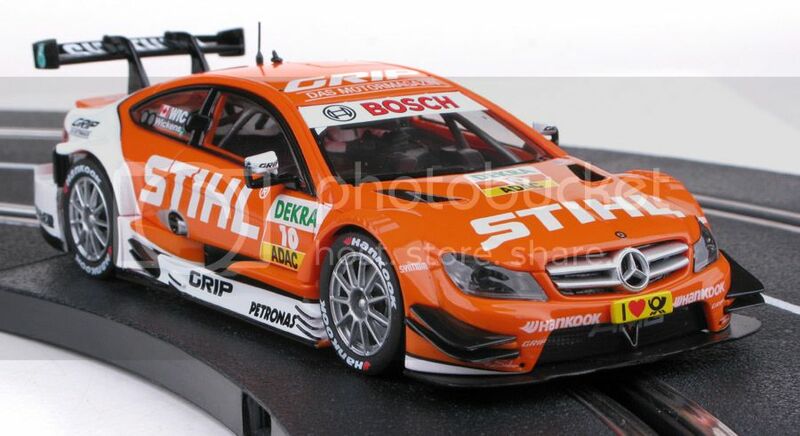 If enough other members purchase them, we may run DTM as a regular series.. I've had the 27476 for a number of weeks now. Do you have any idea when the 27499 "Ice" BMW will be available in the US? Thanks in advance. The J. Hand BMW M4 digital is in stock at Carrera Slots. I just ordered it along with the Corvette evolution C7.R. I am also waiting for the BMW Ice watch car to arrive. Leb Hobbies has the BMW Ice car, and the blue 917 Porsche in digital. Does anyone here run digital crash and burn? I watched the video above and even 1 hour into video there was seldom more than 10 seconds of consecutive green flag racing. Probably not many, if any. Crash and burn rules seem to be rare among traditional slot racing clubs, as well, at least based on what I read about clubs online. We did crash and burn for a while. We also did 3 crashes and then out. Then we used repairable damage points (repair in the pit lane). We've also done active marshaling, and we've done track calls for every crash (as seen above). We'll probably continue trying new things and having a good time. 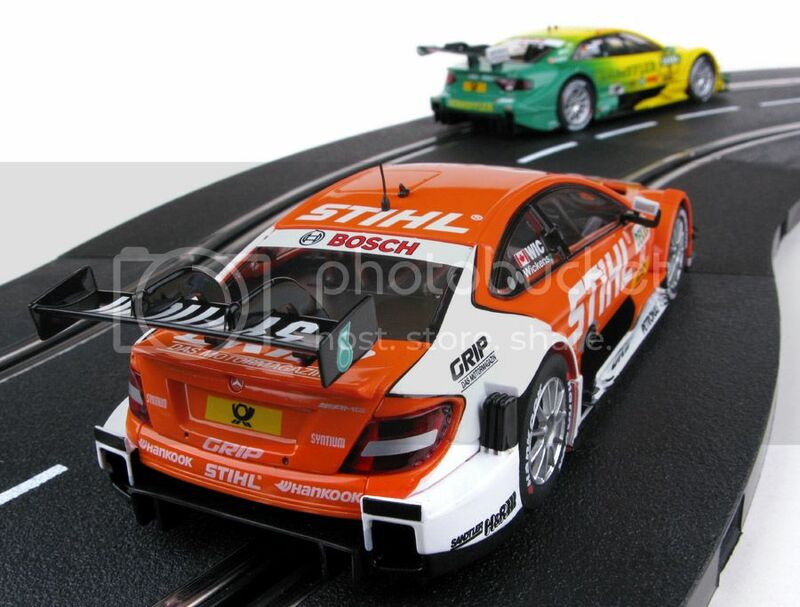 There are as many ways to run digital slot car races as there are traditional ones. As we're not limited to one lane during a race, there's no need to run lane rotation, so we tend to enjoy longer races with racing simulation features. We also prefer races where people are on the track throughout the race, rather than standing and watching just because they happened to cook the corner or time a lane change poorly. That would be like running crash and burn rules for a 4 hour endurance race. In the end, whatever set of rules we use on a particular day or for a particular series, it's still the best drivers that end up winning. With my set-up we use wireless controllers. Each person is responsible for putting their own car back on the track and the others keep racing. Pretty simple really and it keeps the racing action in tact. We figure it is your fault you de-slotted so the time lost in re-slotting the car is your penalty. If you knock off another car with your poor driving or lane change, the offended driver gets to resume first. Aka, crash and dash. It's an idea we've been unable to try, since all of our tracks have too little room to move around. We've tried using a yellow flag that just slows cars down so that the clock doesn't stop and drivers can re-slot cars in their vicinity, but that didn't work out very well. We might have to try that again. In case anyone else feels that this is dragging this thread too far off topic, there's already a good thread to talk about marshaling options when there are a limited number of racers here. Feel free to comment on that thread, a different one, or start a new one. Once again, thanks go to Dave Kennedy and Carrera of America for the generous SWAG he sent to DRAWW in support of our Carrera DTM series. Not a supporter of this forum! Last edited by FantasyWorldHobbies; 11-03-2015, 04:46 PM.